Lionel Nathan de Rothschild was born November 22nd 1808 and died June 3rd 1879. He was a British politician and the son of Nathan Mayer Rothschild and Hanna Barent Cohen of the prominent Rothschild banking family. In 1847 he became the first jew to be elected to the British House of Commons as one of four MPs for the City of London. At this time Jews were still barred from sitting in the chamber due to the Christian oath required to be sworn in so Prime Minister Lord John Russell introduced a Jewish Disabilities Bill to remove the problem with the oath. 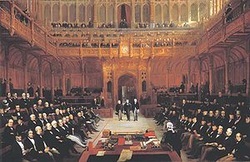 In 1848, the bill was approved by the House of Commons but was rejected twice by the House of Lords. After being rejected again by the Upper House in 1849, Rothschild resigned his seat and stood again winning in a by-election in order to strengthen his claim. In 1850, he entered the House of Commons to take his seat but refused to swear on a Christian Bible. He asked to use the Old Testament only. This was permitted but when omitting the words "upon the true faith of a Christian" from the oath he was required to leave. In 1851 a new Jewish Disabilities Bill was defeated in the House of Lords. In the 1852 general election he was elected again but the next year the bill was defeated again in the upper house. Finally, in 1858, the House of Lords agreed to a proposal to allow each house to decide its own oath. On July 26th 1858 de Rothschild took the oath with a covered head, substituting "so help me, [using a Hebrew word for] God" for the ordinary form of oath, and then took his seat as the first Jewish member of Parliament. He was re-elected in general elections in 1859 and 1865, but was again defeated in 1868. He was returned to his seat unopposed in a by-election in 1869 but was again defeated a second time in the general election in 1874. His son, Nathan Mayer de Rothschild, was the first Jew to become a member of the House of Lords. Lionel de Rothschild died in 1879 and his body was placed in the Willesden Jewish Cemetery in the North London suburb of Willesden. Joshua Lionel Cowen was born in 1877. His family immigranted to New York after the Civil War. At that time, the railroads in America were the chief mode of transportation. With the "Golden Spike" meeting of the Union Pacific and Central Pacific lines in 1869, the nation and the continent became unified for the first time in history. It also was the signal of the birth of a world power. Just before Thomas Edison finally perfected his electric light after thousands of tries, Cowen, founded Lionel trains in 1900. Lionel Brockman Richie was born on June 20, 1949 in Tuskegee, Alabama. He is an singer-songwriter and record producer who get his start in few R&b groups becfore hitting it big with The Commodores joining in 1968. He has sold (solo or as group member) more than 100 million records. Richie grew up near the campus of Tuskegee University. His grandfather's house was across the street from the home of the president of the Institute. His family moved to Illinois where he graduated from Joliet Township High School in East Campus, Joliet. He became a star tennis player and was given a tennis scholarship at Tuskegee Institute and later graduated with a major in economics. After receiving his undergraduate degree from Tuskegee, Richie briefly attended graduate school at Auburn University. He is also a member of Alpha Phi Alpha Fraternity. He joined The Commodores in 1968 and that same year they were signed to Atlantic Records for one record and then they were signed to Motown after that. They had many hits; including: Machine Gun, Brick House, Easy, Three Times a Lady, Still and Sail On. By the late 1970s, he had begun to accept songwriting commissions from other artists. He composed Lady for Kenny Rogers, which hit #1 in 1980, and produced Rogers's album Share Your Love the following year. 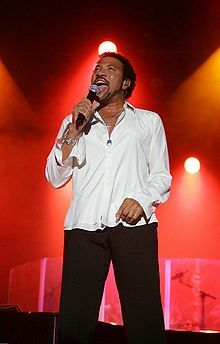 Also in 1981, Lionel Richie sang the theme song for the film Endless Love with Diana Ross which topped the pop music charts in the US and in the UK. It became one of Motown's biggest hits. With the success of Endless Love, Lionel decided to branch out into a full-fledged solo career in 1982 and leave The Commodores for good. He was replaced as lead singer for The Commodores by Skyler Jett in 1983. He went on to produce many chart-topping singles, such as Truely, Hello, Stuck on You, Say You, Say Me, Running With the Night, All Night Long, Dancing on the Ceiling and We Are the World with Michael Jackson. Some of his best albums have been: Lionel Richie, Can't Slow Down and Dancing on the Ceiling.